Diligently consume tomatoes, it turns out we can prevent a stroke that could have very fatal, as quoted from the research the researchers in Finland. The researchers investigated the impact of the chemical elements are colored bright red lycopene in tomatoes, pepper, and watermelon. Studies involving 1031 correspondent showed that those with the most lycopene in their blood will be more resilient to prevent a stroke. Meanwhile Stroke Association requested that the results of this study followed by a more detailed study about the effects of lycopene on the prevention of stroke. According to the study - whose results are published by the BBC - the men who were respondents monitored lycopenenya levels in the blood for 12 years. 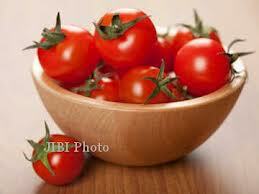 The first group are those who lycopenenya low levels. There were 25 cases of stroke in this group of 258. The second group was a man of high lycopenennya levels, was only 11 people of the 259 respondents who had a stroke. The researchers also concluded that the consumption of fruits high in lycopene can reduce the risk of stroke by 50 percent.